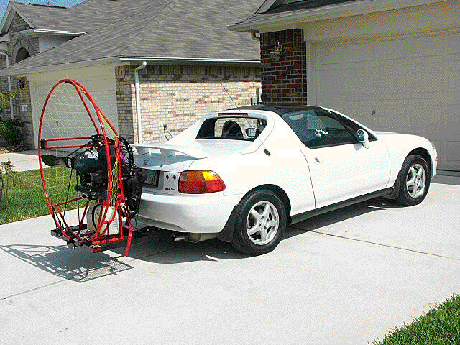 Having a small sports car, it is not easy to transport my paramotor. I needed a solution that would allow me to transport my machine assembled and ready to fly. I decided to purchase a "cargo tray" just like many other pilots. I was not to happy with just securing the motor to the tray with bungie cords. A "lock" type, jam nut, a couple of large fender washers, lock washers and a large wing nut. I also got three feet of 1/2" plastic tubing. 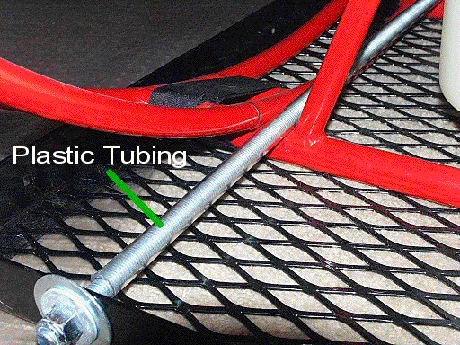 I slid the tubing on the threaded rod, put the lock nut and one large washer on one end of the rod. When I put my motor on the tray, I slide the rod through the hole in the tray, across the bottom part of the frame and out the other side hole. I then slide the large fender washer on, lock washer and wing and tighten down.. 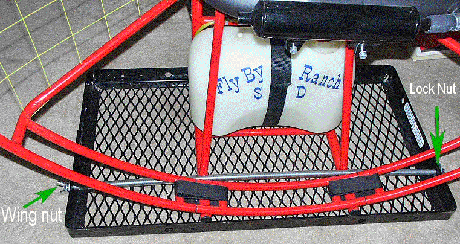 The plastic tubing protects the paint on the paramotor frame. The holes in the tray are off a little for a 1/2" rod, but by pressing down, the rod will slide through and it just holds the motor tighter to the tray. The motor will not move, front to back or side to side, yet it is still easy to remove.. One wing nut and it's free..
Hope this helps others to simplify their transportation, instead of 13 bungie cords and 50 feet of rope.